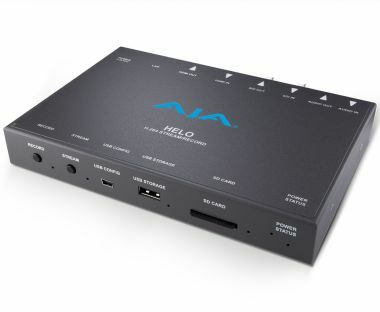 HELO is AJA’s new H.264 recording and streaming stand-alone appliance. HELO brings both SDI and HDMI I/O into a single appliance with the ability to simultaneously stream out to your Content Delivery Network (CDN) as well as encode and record beautiful H.264 files to either SD cards, USB storage or network based storage simultaneously. HELO’s small and robust form factor is essential for your busy schedule. Live events, webcasts, production and post locations vary and you need a device that can take the heat. HELO is designed to travel well, fit wherever needed and continuously deliver; all with full size connectivity. HELO offers both HD-SDI and HDMI source inputs in a single device with the ability to encode up to 1080p 60 in beautiful and efficient H.264. Stream out to your Content Delivery Network (CDN) and record to SD cards, USB storage or network based shares simultaneously. 2-Channel Stereo Audio can be encoded at up to 24-bit 48kHz at data rates ranging from 32kbps to 256kps in Mpeg-4-LC, allowing you to make the most appropriate choice for your project's needs. A USB connection and robust web-browser based UI allows you to setup and configure your CDN connection before you even arrive at your event. Once there, simply press the Stream button and deliver your project across HELO’s Ethernet connection, which allows support for RTP/RTSP, RTMP as well as Unicast. HELO offers a dedicated Record button right on the front of HELO’s small and mobile interface for immediate recording. Simply plug in your NTFS 3.1 or FAT 32 formatted USB drive, SD card or connected network storage and record immediately. HELO’s H.264 based encoding not only ensures beautiful, efficiently sized files, it means your recording medium choices are wide open. Utilize USB thumb sticks, drives and RAIDs, common SD or SDHC media or network shares across a switch. Pick to suit your project.